We’re always proud of our monthly newsletter, but this month’s SEO Newsletter: The Data Edition is a cut above. The SEO Newsletter keeps readers up-to-date on the ongoings of the professional community, supports understanding our daily marketing practice in the big picture of business, and ensures that what we do for clients and business provides the utmost possible value. Let me ask, do the following at all match your own goals for your professional growth? Because this is what we believe the SEO Newsletter helps readers do. 1. Stay aware of changes by search engines and social platforms that affect a business’s Web presence. 2. Understand the marketing strategies of industry leaders and how you can use the best strategies and practices in your work. 4. Always be learning. Always be improving. Always be efficient. 1. Warnings going out in Google Webmaster Tools are common these days. While Google’s aim is to improve transparency with webmasters, Google has caused confusion due to some mistakes in execution. In Google Link Warnings Simplified, the meanings behind the messages are laid out clearly. As is what a webmaster should do about them. Got more analytics data than you can shake a stick at? Bat it out of the park with data analysis tips in this month’s feature article. 2. This newsletter leverages the industry brain-trust to the benefit of readers in two ways. 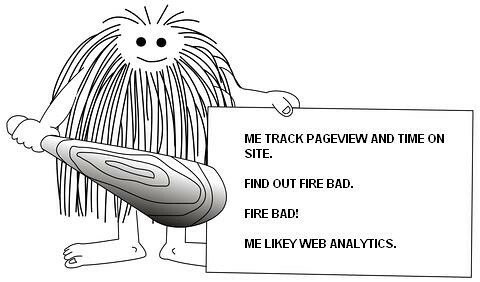 The feature article, Stop the “Caveman” Web Analytics and Do This, distills analytics data in a way you can use right now with the help of Matt Bailey. Matt is a frequent speaker on Web analytics and a champion for using data smarter. If you’ve ever had to prove your marketing department’s ROI, you’ve wrestled with finding value in data. In this interview Matt gives advice that would help companies avoid data deluge to get to the heart of the matter in data. The newsletter also analyzes the results of the biennial SEO Industry Survey in this month’s Hot Topic. The survey responses point to how marketing teams are spending time and budget. We find that SEOs as individuals prioritize SEO, then analytics, followed by link building and content marketing. Meanwhile, SEO teams are more likely to allocate time to SEO, followed by link building and then content creation. It’s important that Internet marketers know how resources are spent across the industry and where the profession is finding the most value delivered. 4. If you’re the kind of person that’s never settled for good enough, at Bruce Clay, Inc. we hear you. We’re the same way. And we like to think we help others toward their goals of continuous professional improvement. That’s why we crafted the SEOToolSet — to assist SEOs serve businesses through informed optimization campaigns guided by data intelligence. To that end, I’ve outlined a process for on-page optimization that aligns with the diagnostic tools and reports of the SEOToolSet. So I just dropped a lot of links backed by a lot of content. I’ll let you to it. I just ask that when you’ve seen what you want to see, you let me know here in the comments what you think. Whether you think the newsletter fails or succeeds in any of the above, we want to know.